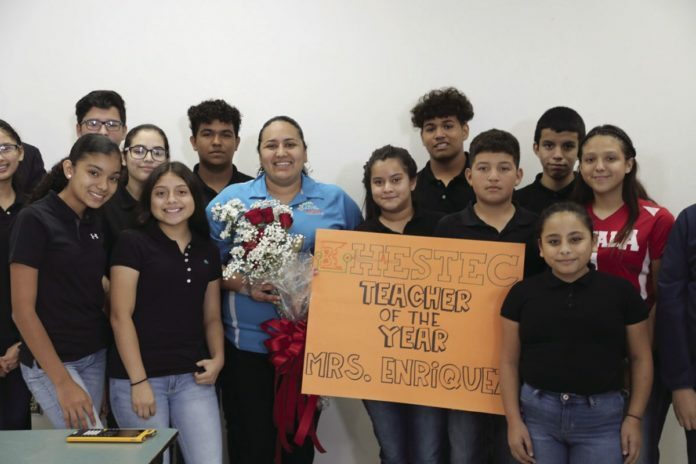 Gladys Enriquez, center, a math teacher at La Joya Independent School District’s Lorenzo de Zavala Middle School, was recently notified that she had been named the Hispanic Engineering Science and Technology (HESTEC) Math Teacher of the Year Award. Gladys Enriquez, a math teacher at La Joya Independent School District’s Lorenzo de Zavala Middle School, was recently notified that she had been named the Hispanic Engineering Science and Technology (HESTEC) Math Teacher of the Year Award. HESTEC Week, held at University of Texas Rio Grande Valley, has become a nationally recognized model for promoting science, technology, engineering and math (STEM) careers among young people of all backgrounds and ethnicities. The event raises awareness of the opportunities available within STEM fields and promotes higher education in the Rio Grande Valley. Enriquez, who was nominated by the campus’s GEAR UP Coordinator, Kristina Villarreal, is an 8th grade math teacher and Department Chair at Zavala Middle School with 12 years of educator experience. A 2003 graduate from la Joya High School, she obtained her Mathematics degree from the University of Texas-Pan American in 2007 and was the first member in her family to graduate from college. Fellow coworkers describe Enriquez as someone who demonstrates compassion and love for all her of her students. And how her dedication is evident in her teaching style, classroom management, and the relationships she builds with her students and their families. Enriquez will be recognized on Oct. 5 during the HESTEC Educator Day Reception at the University of the of Texas Rio Grande Valley.